Studies on societal path dependencies tend to focus on mechanisms that anchor and stabilize national trajectories while paying less attention to transnational interactions and multilevel governance. This paper explores processes of path transformation in societies that are presumed to have the characteristics of open systems. Two pairs of case studies are presented and compared. The first illustrates institutional change through collision, when a national path meets with another. The second describes the emergence of transnational institutional paths and the impact of that process on national institutions and their (potential) transformation. The results indicate that path transformation often stems from a gradual succession and combination of incremental steps and junctures – change is gradual but consequential. They also point to increasing co-evolutionary interaction between national path transformation and transnational path creation. This implies a need for analytical tools that are adapted to the analysis of multi-level, nested processes of institutionalization and de-institutionalization. The paper suggests that the concept of path generation allows for a better specification of the conditions for change in existing societal paths and for the emergence of new paths in the case of open systems than the concept of path dependency. We thank Suzyon Wandrey for her careful language editing of the manuscript. 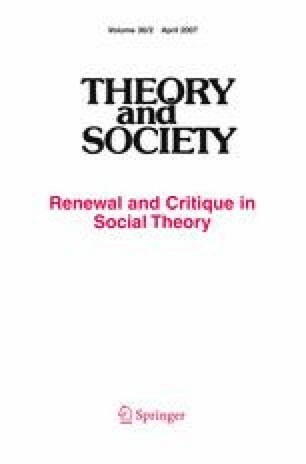 We also thank the reviewers and Editors at Theory and Society for highly helpful comments and suggestions that made it possible to improve the article. ICPAC (International Competition Policy Advisory Committee) (2000). ICPAC Final Report. Retrived October 12, 2006, from http://www.usdoj.gov/atr/icpac/finalreport.htm. Melamed, D. (2000). Promoting sound antitrust enforcement in the global economy. Speech of the Acting Assistant Attorney General, Antitrust Division, US DOJ, before the Fordham Corporate Law Institute 27th Annual Conference on International Antitrust Law and Policy, New York, October 19. Retrieved from http://www.usdoj.gov/atr/public/speeches/6785.htm. Monti, M. (2002). A global competition policy? Speech by the European Commissioner for Competition at the European Competition Day, Copenhagen, September 17. Retrieved October 12, 2006, from http://europa.eu.int/comm/competition/speeches/ index _speeches_by_the_commissioner.html. Muris, T. (2002). Competition agencies in a market based global economy. Speech of the Chairman of the Federal Trade Commission at the Annual Lecture of the European Foreign Affairs Review, Brussels, July 23). Retrieved from http://www.ftc.gov/speeches/muris/020723brussels.htm. Schaub, A. (2000). Assessing international mergers: The Commission’s approach. Speech of the Director General for Competition, European Commission at the EC Merger Control 10th Anniversary Conference, Brussels, September 14–15. Retrieved October 12, 2006, from http://europa.eu.int/comm/competition/speeches/text/sp2000_015_en.html. Van Miert, K. (1997). International cooperation in the field of competition. A view from the EC. Speech by the European Commissioner before the Fordham Corporate Law Institute 24th Annual Conference. New York, October 16. Retrieved October 12, 2006, from http://europa.eu.int/comm/competition/speeches/text/sp1997_073_en.html. WTO (2000). Report of the working group on the interaction between trade and competition policy to the General Council. Retrieved from http://docsonline.wto.org/imrd/.